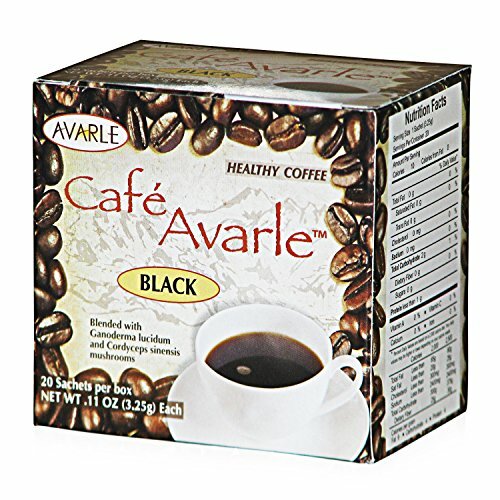 Cafe Avarle Healthy Black Coffee with Ganoderma & Cordyceps is a gourmet blend of exotic coffee beans, blended with high grade extracts of Reishi (Ganoderma) and Cordyceps Mycelia mushrooms. Reishi (Ganoderma Lucidum) known as "The Miraculous king of herbs", has been endlessly used for over 4,000 years. Research shows that with consistent use, Reishi could provide a powerful enhancement to the immune system, promote restful sleep, give energy & detoxify the body. Also, Cordyceps Mycelia is used in traditional Chinese Medicine to promote Cardiovascular health & strength, sexual potency and immune system health. Try this delightful coffee and add cream & sweetener to taste. If you have any questions about this product by Avarle, contact us by completing and submitting the form below. If you are looking for a specif part number, please include it with your message.